I have a bit of catching up to do. There are hand knits that were finished in ’09 that you haven’t seen yet and they need to be blogged. Let’s start with the Merletto Mitts. I finished them on 12/23, just in time to give them to my dear friend Jo-Ann. Now, Jo-Ann is someone I have only recently discovered as a friend. We met through Kiwanis and she and I bonded almost instantly. She is fun and sweet and clever and generous to a fault. She is a devoted mom and hard-working Kiwanian. She wants to learn to knit and I have promised to teach her. She admired my Genmaicha Mitts one day and asked how long it would be before she could knit herself something like that. I decided right then and there that I would knit her a pair of mitts for Christmas. That’s right. I overcame my aversion to Christmas kitting for this woman. Those of you who have been around here for a while know just what a big deal that really is. These mitts, though, are a perfect gift knitting project. The pattern is well written and they are a quick and fun knit. I used some reclaimed sock yarn, and it worked perfectly. As I mentioned when I first blogged about these mitts, Jo-Ann didn’t have any idea I was making them for her and the surprise element made the gifting all the better, I think. Plus, she left a comment on that original post about how handmade gifts are the absolute best and they really let the recipient know that they are loved. I have to admit that when I read that comment I thought maybe she suspected these were for her and she might have been doing a bit of sucking up. But seeing her face when she opened the package let me know that she truly was surprised. And thrilled. And as for that thing she wrote in her comment about how ” a gift that was lovingly made by hand just proves that the person gifting loves you to pieces,” well, she couldn’t have been more accurate about that. There’s not much better than that type of reaction to a handknit gift! The mitts are beautiful. Isn’t it the best to truly surprise and please a friend? 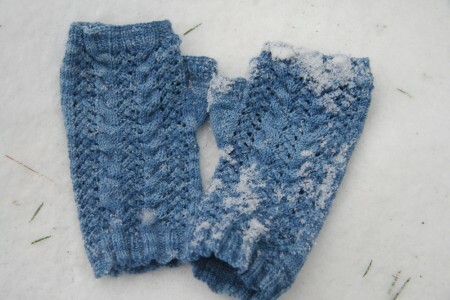 The mitts are wonderful – I’ve got those on my “to knit” list, as well. Awwww. That makes every stitch special. you have made a really good “new” friend. So well said. I have received knit gifts from you and find they are my biggest treasures. The mitts are darling. They are so pretty! Nicely done. Such a sweet pattern and the color is perfect for it. Have a terrific Wednesday, Carole! Gifts from the heart are the best and these are just lovely! Beautiful mitts! It’s so nice to meet someone that you instantly bond with. That’s only happened to me once and it’s a friendship I still value very much. I’ve always thought that about handmade gifts, too, which is probably why they are my favorite to give and receive. 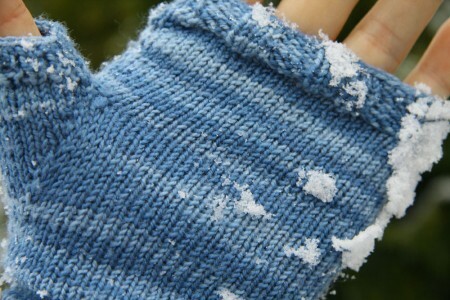 I really like these mitts! Aw, that made it worth it to hurry-knit a gift. I’m so glad they were that well received. She sounds like a very worthy recipient! Lucky you to have found a wonderful new friend. And lucky her to have wonderful new mitts! What a nice post! And how great to connect with someone in such a meaningful way. 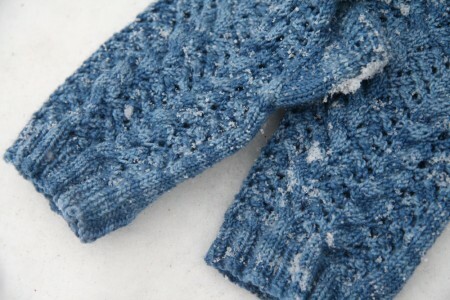 The mitts are so pretty — I’m sure Jo-Ann is loving them! That’s so sweet! 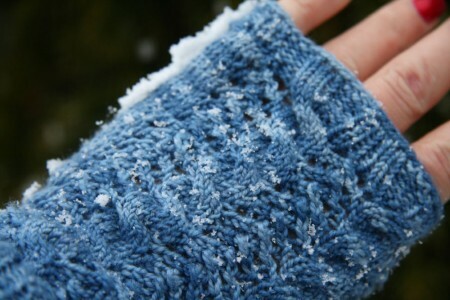 I wear my Genmachia mitts every day, over a pair of thin gloves – perfect amount of warmth. Very pretty and I’m glad they are loved and appreciated. Don’t you love to give handmade gifts to people who know how to “ooh and aah” properly? They are in line for future handmade gifts, that’s for sure! Really cute mitts!! That is a great reaction to a lovely gift. See… gift knitting isn’t so awful. Those are extremely fabulous, and they remind me that January is mitten month. What a great post. Knitting for an appreciative recipient is the best! How cool! Those mitts are on my list to knit. I think they are beautiful. It’s hard to type a comment, as for some reason my monitor is all blurry, hehehe. I do love the mitts, and can’t wait to pick them up again this evening 🙂 I had no idea you had an aversion to Christmas knitting, but I’m ever so thankful that you overcame it for ME! What a lovely gift…great color too! And how nice to have a recipient love what you made for them. My younger son was away at college when I mailed him his first pair of handknit socks. He sent me a thank you note that called them “hugs for his feet”. You just know I melted…and he got more socks, even though he wears size 13 shoes. Sounds like the perfect gift for the perfect person. Well done, Carole! A nice home-made present to a good friend–what could be better?